← Disney/Pixar BRAVE – Hilarious “Kilt” Video! In cooperation with the U.S. Consumer Product Safety Commission (CPSC), Wal-Mart Stores Inc., of Bentonville, Ark. and Toys R Us Inc., of Wayne, NJ are announcing the recall of about 21,000 inflatable Banzai in-ground pool water slides. 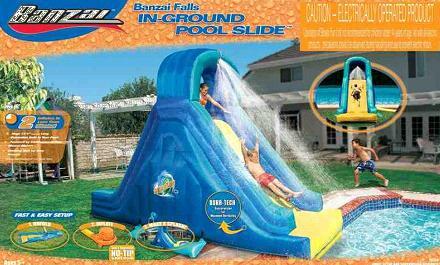 During use, the slide can deflate, allowing the user to hit the ground underneath the slide and become injured. The slide is also unstable and can topple over in both still and windy conditions and carries inadequate warnings and instructions. The recalled slides, which were manufactured in China by Manley Toys, Ltd, were sold at Walmart and Toys R Us nationwide from January 2005 through June 2009 for about $250. The recalled slides have the barcode number 2675315734 and model number 15734. Both the barcode and model number appear on the original packaging but are not on the actual slide. For additional information from Walmart, call (800) 925-6278 between 7 a.m. and 9 p.m. CT Monday through Friday, or visit the firm’s website at www.walmartstores.com.